I washed my Busy Bee scarf this morning, and I felt very brave. I’ve never even considered washing handspun in the machine, but this was Superwash Blueface Leicester, so I went ahead and did it. I like the results! It’s so soft and has a nice halo, and it kept its shape just like socks do. I wouldn’t have chanced it if the scarf were delicate, but this is a sturdy 2×2 rib. I love it! I think it will go into a box of potential gifts. 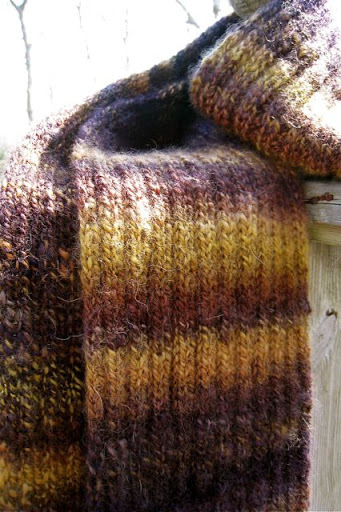 You never know when a handspun, handknit scarf might be just the ticket. One of my other accomplishments for the day is this little skein of yarn that I began spinning on Wednesday. 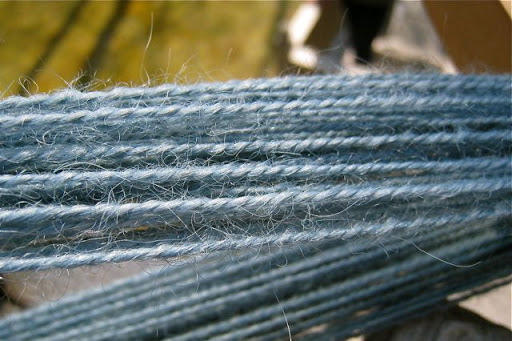 It’s Wensleydale wool in a color called “Blue Sky Indigo” from A Verb for Keeping Warm. I had two ounces, so my plied skein is just about 100 yards. I’ll figure out what to do with such a small amount after it’s set and washed. In the mean time, I had a happy time playing with the fiber and my Reeves wheel. I’m waiting for my order of Targhee top in “The Shore,” also from A Verb for Keeping Warm. April is Targhee month in the KBOW Woolalong, and since I seem to be in a spinning mode, I’ll go with it. It should arrive tomorrow, so on Wednesday, after I get back from renewing my driver’s license, I’m going to spin the rest of the day away. That’s the plan, at least! Before long, there’ll be yarn to post about — prizes for the end-of-the-month drawing for comments to my Souvenirs and a Celebration post. I have some lovelies to show you! If you haven’t commented yet, please do. My donation to GCF grows with every one! Your comments have been so thoughtful, and they keep me thinking, too. There are all kinds of celebrations, both sweet and bitter. Bitter and sweet make life, I think. We don’t get one without the other. Oh Jane, the Wensleydale is PERFECT! You spun it so beautifully, and I know you'll find just the right use for it. And you're quite right about the bitter and the sweet. When you spin, I believe in my heart of hearts that straw turns into gold. I do. Spin on, sister!! I almost have a panic attack when I machine wash my knits the first time. It's almost funny how in a tizzy it gets me.That blue is just stunning, can't wait to see what you make with it. I'm glad the scarf weathered its adventure in the washing machine well! Gorgeous. What a gorgeous scarf! Lucky gift recipient whoever they may be. I love the colors! The bitter in life allows us to appreciate the sweet all the more. Hugs, Jane! The Busy Bee scarf is lovely after its adventure in the washing maching. 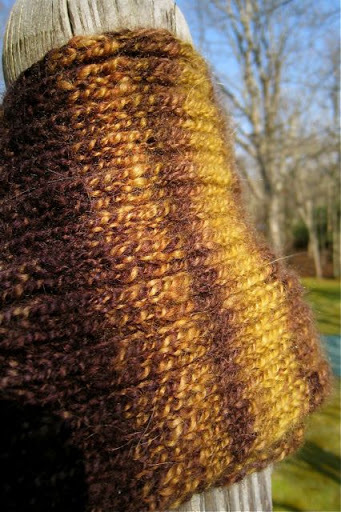 I love the color of the Wensleydale fiber too.